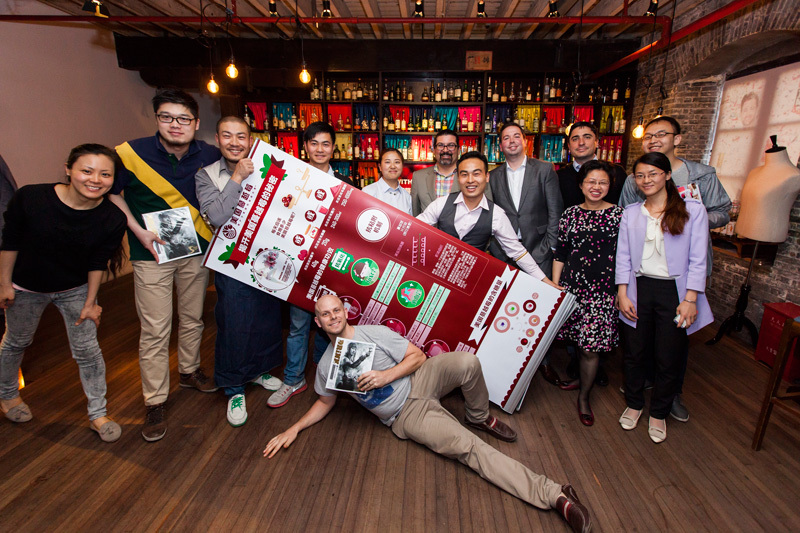 On 15 May 2014, Shanghai local and regional bartenders gathered at the bar of one of China's leading beverage publications to learn about U.S. cranberries and their applications in mixology. Mr. Soares explained that the fruit’s internal air chambers allow it to float in the water and that most wet harvest cranberries are used for processing into sweetened dried cranberries, sauce, and juice. He further explained one of the fruit’s most unique characteristics that its health properties are not diminished by processing or cooking, and showed the audience a table of optimal daily consumption quantities for varies product forms. The Q&A session was followed by a cranberry cocktail workshop by Mr. Yang, a master mixologist. Eight innovative cranberry cocktails were demonstrated in four categories ranging in liquor content: mocktail, low alcohol, simple mix, and creative twists on classic cocktails. After the demonstrations, attendees were invited to taste each of the cocktails, as well as indulge in some cranberry oat bar snacks prepared by Chef Michael Rosenblum, Resident Chef of the U.S. Ambassador to China. "Cranberry is a new product for the China Market. I came back to Shanghai from the UK in 2010 and saw cranberry juice being used in some bars, however not many bartenders knew what it was. Now you can find Cranberry products in shops, supermarkets, and many bars and restaurants. But still, if you ask most bartenders what are cranberries or what a cranberry looks like, most of them still don't have any idea. I believe that in the near future more and more industry people and consumers will understand cranberry products and enjoy them more. 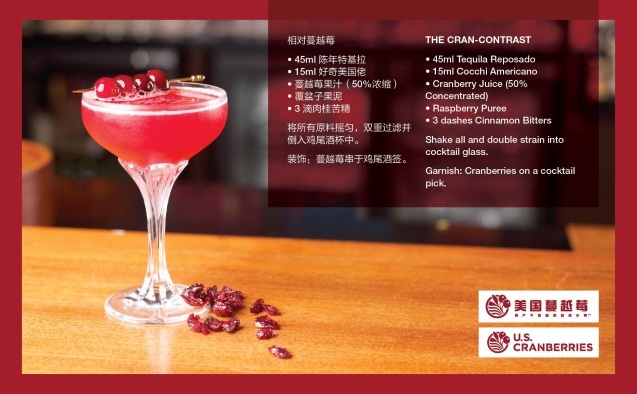 It is from this perspective that I have created these 8 cranberry drinks for the first U.S. Cranberry Masterclass by CMC and DRiNK magazine in China." Based on the level of interested shown, it is expected that many attendees will return to their bars inspired to make their own cranberry cocktails, and more able to educate their colleagues and customers about U.S. cranberries. Just days after the workshop, the CMC China office had already received an inquiry from one attendee asking where 100% cranberry juice can be sourced in Shanghai. CMC will be holding two additional U.S. Cranberry Masterclass tours in China in 2014.